What Kind of Airbag Protection is in the Volkswagen Beetle? There was some interest in the use of airbag safety in vehicles in the early 70s. Then, without consumer support, the car companies dropped airbags from their repertoire. The U.S. Federal Government brought them back in a big way is 1998 by requiring every new car and truck sold in the U.S. have airbags in both front seats. Volkswagen has one of the highest safety ratings for sub-compacts in their Beetles. The Volkswagen Beetle, at first, had the two required front airbags and then updated to include front head airbags. Not long after, the Beetle included side-impact airbags. Finally, the Beetle upgraded to include rear head bags. Altogether, the airbag deployment possibilities in the Volkswagen Beetle excel above those found in comparable vehicles. 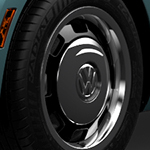 At our dealership, we proudly display the Volkswagen Beetle and point out its outstanding safety performance.